Pantera I won in straight falls, wants a title match. Rudos jumped the tecnicos and turned into a crazy brawl, but Terry & Cerbero snuck out a first fall win and took fall two as well for the straight fall win. Hair match challenges followed. Traumas made it here from working the Elite show, and got the win on this show. Diablo Jr. I replaced Hijo del Fishman. 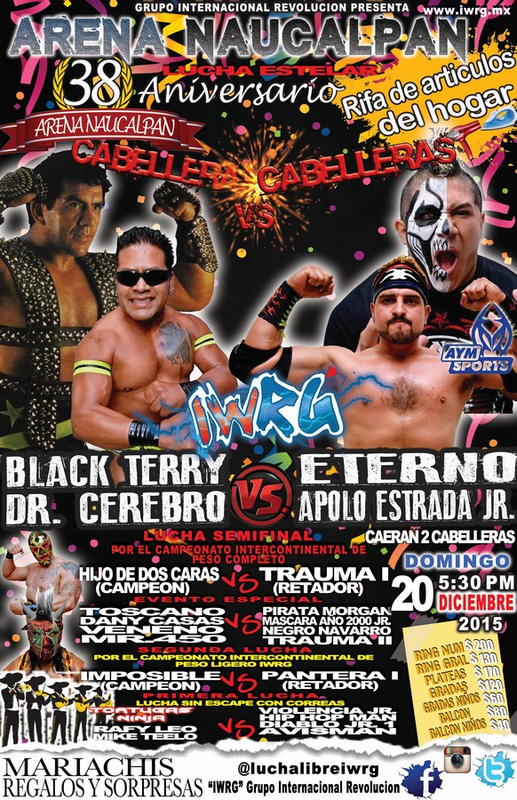 Apolo & Eterno are the Insoportables, and challenged Cerbero and Black Terry to a hair match after the win. Mr. 450 worked twice, replacing Toscano. Mascara got in a foul on Veneno. Dr. Karonte looks like the Mini Karonte from the last Elite show, who may have switched to a non-mini name. Kaling's first appearance here in over a year. Halloween Jr. fouled Hijo de Mascaa Sagrada. Referee Reyes Rosas was back in this match (on this show), after being off for six weeks after the ending of Castle of Terror. 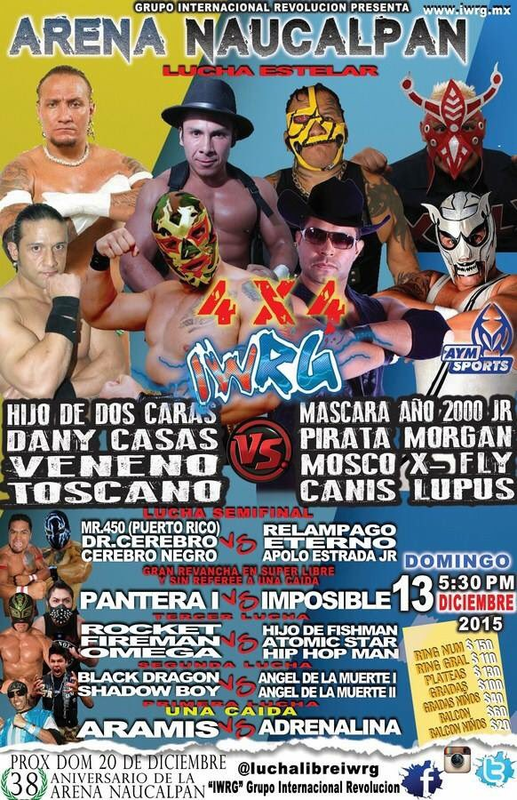 Rudos ended up taking the tecnico's masks in the post match. 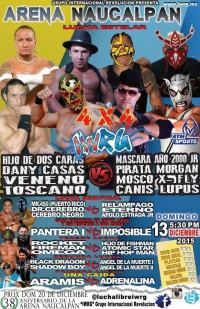 Titan & Triton were advertised but didn't appear (CMLL veto? ); IWRG announced Crazy Boy (as an indie) ahead of time and Danny Casas was also added. Damian snuck in a foul on Argos for a win, and lucha extreme challenges followed of course. Money thrown in. 1) Fresero Jr., Leo, Mike, Teelo b Avisman, Diablo Jr. 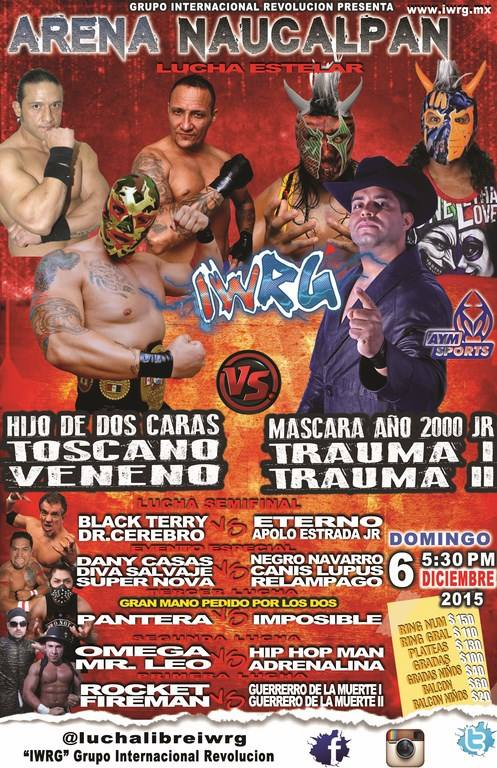 I, Hip Hop Man, Violencia Jr.
Fresero replaced Rafy (got moved up.) Avisman was knocked out by a Fresero german suplex. He was out for a while and exited the match after he recovered. Tecnicos still won. Rafy replaced Mr. 450. Danny Casas attacked his partner Toscano, setting up a hair feud. first defense. Dos took 1/3. The new Insoportables win their first big match. 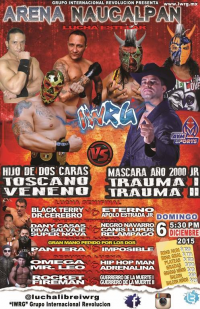 Rudos took fall 1, tecnicos took fall 2, and the third fall came down to Eterno & Terry (who started this whole feud.) Eterno and the referee got into a struggle over a chair, which ended up smacking Terry in the head. Eterno covered for the win. Terry & Cerbero got their heads shaved. 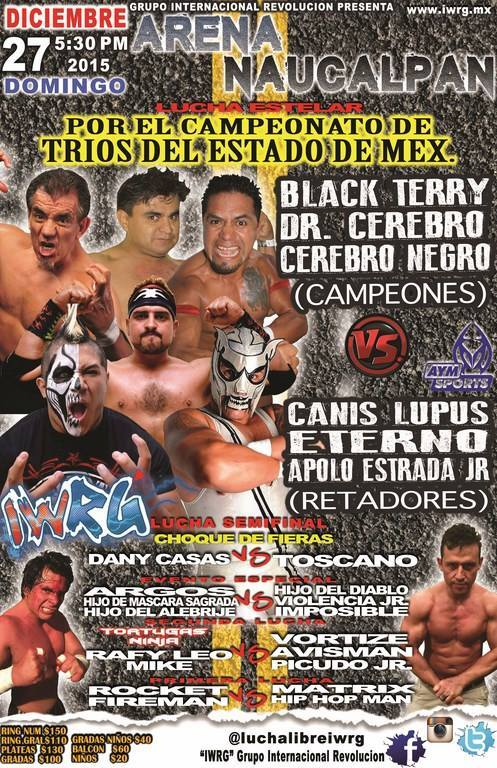 Apolo & Eterno challenged for a trios title match. Shadow Boy & Black Dragon replaced Fireman & Rocket. Three falls match but Danny didn't really win any of them - Toscano just got DQed in the second. Toscano challenged Danny to a hair match next week. Canis Lupus doesn't appear to be an official members of Los Insoportables. Fought more as a brawl than a technical title match. Terrible Cerberos took 1/3. 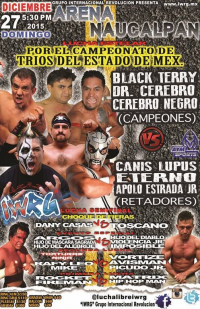 The last saw Eterno wipe out Black Terry with a tope, but the Cerebros beat Apolo and Canis for the win. Second defense. Money thrown in.